Venus Tropicaux is gusto, squalor, delirium, bliss and mischief in all its raw, unfiltered noisy brilliance. Within their succinct 15-minute sets, these Rotterdam post-punk firebrands create a deliciously haywire pocket universe to call their own. 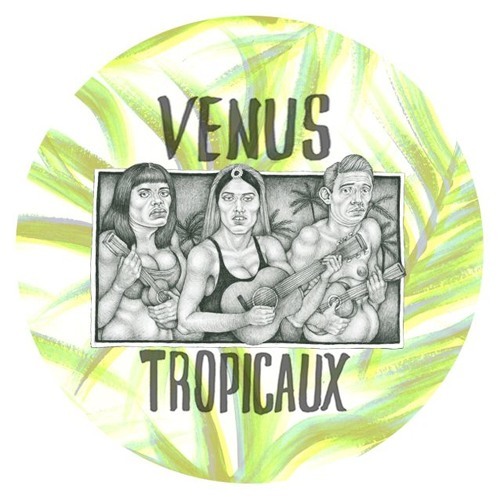 Abrasive and hook-heavy, cheeky and austere, Venus Tropicaux is an equation that by any means shouldn’t make sense, but somehow does because of the unique chemistry between three individuals. You can’t help but be charmed by the reckless abandon and joyful spontaneity Shelley Emily (voice/guitar), Shalita Dietrich (voice/guitar) and Zacharias Danson (drums) nosedive into this band-thing. Venus Tropicaux ‘s exciting EP Lycra Pants finally captures this singular energy in all its untethered glory. Delirious yelps and chants lash out like sharp talons, as the fiery guitar bursts and crude drum patterns detonate with the haphazard intensity of a firecracker.